The world has ended twice on The 100, but for the people of the Ark, and those that have been on the ground for a long time, they’ve suffered numerous ends and new beginnings. Clarke, Bellamy, and all the others that were originally sent down to explore a possibly inhabitable Earth knew nothing of the first time the world ended, or at least didn’t experience it directly. For them, life ended and began on the Ark, alive, but certainly prisoners in space. Their new life began on Earth, and one moment after another challenged them to adapt, becoming new people with new sets of skills in order to keep themselves alive. Now, they’ve survived another catastrophe, and they’re being challenged once again. There’s no such thing as stability in the world of The 100. Just as one begins to adapt to their surroundings and create a new normal for themselves, such as Clarke and Madi surviving (and thriving) in the woods after Praimfaya, there’s a new disruption to deal with. At the start of season five that disruption is the prisoners of Eligius. Gone for decades aboard a mining ship, the prison laborers have no context for the scorched planet they come back to. All the fighting, killing, and betrayals that have defined the existence of the initial 100 and the Grounders might as well have never happened. The people of Eligius are encountering this world as if it’s new, strange, unpredictable territory, and that opens up some interesting new avenues for the show to explore. While the show hasn’t always put the theme front and center, The 100 is certainly poking at ideas of colonialism and violence. It’s a theme that’s always humming in the background, inherent in the very plot of different “crews” encountering each other in a land ravaged by a previous generation. 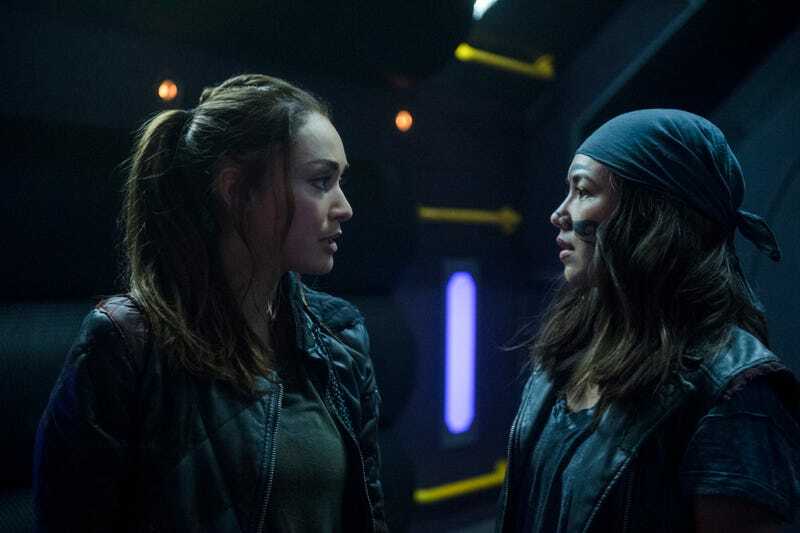 It wasn’t long after the original 100 landed on Earth that they ended up in a violent conflict with the people who’d been surviving there for decades, and it wasn’t long after the Eligius prisoners returned home before they raided Clarke’s home. Occupying forces are simply part of this world. The 100 has always been a punishing show, one defined by grim truths about history, humanity, and our inherently violent nature. For every moment of hope there’s two or three truly crushing twists that kill that hope. “Sleeping Giants” is one of those episodes that presents a number of crushing defeats. When the Ark team tries to land on the Eligius ship and look for fuel to get back down to Earth, Emori fails on her first attempt at taking over the navigation from Raven. When Clarke and Madi put up a fight against Charmaine and the other prisoners, Clarke gets captured. 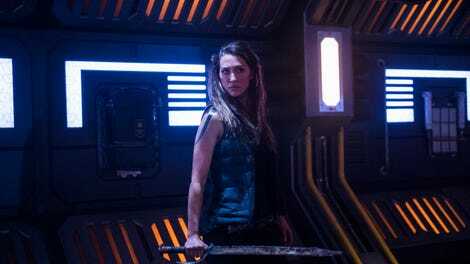 At the end of the episode, Murphy has agreed to stay aboard Eligius with Raven, a move he makes without knowing that Raven has lied about the escape pod. “Sleeping Giants” is the kind of episode that The 100 excels at, digging into the murky area of morality that comes with clashes between people who don’t understand each other. What’s interesting though is that the most fascinating aspect of the episode isn’t related to warring clans, but rather Emori’s relationship not only with Murphy, but also with herself. “Sleeping Giants” uses her navigation failure, and subsequent verbal jabs with Murphy, as a way to look at the dynamic of the group on the Ark as a whole. Faced with five years of isolation and only a glimmer of hope of getting back to the ground, everyone got down to work to making their circumstances more bearable. Emori in particular took the time to learn something new, to push herself into uncomfortable spaces where she’d be forced to adapt, whereas Murphy’s only grown more jaded and cynical. “Sleeping Giants” feels like necessary setup for the season’s various conflicts—will Raven and Murphy get to Earth? Will Bellamy see Octavia again? How will Bellamy and Clarke navigate a deal with the Eligius prisoners?—but it’s hardly an episode spinning its wheels. Rather, there’s a focus to the character work that’s more than welcome after two episodes defined by action and plot. “Sleeping Giants” has plenty of action too, but it’s the more contemplative moments that stand out, perhaps heightened by the brutality we’ve already seen. “Sleeping Giants” is packed with moments that feel revelatory for this season, giving us necessary insight into characters who are now six years older than when we saw them at the end of last season. There’s Murphy doing his best to offer up hope to Raven, spurred on by the fact that he’s lost Emori. He knows it’s his fault, and he’s trying to atone for that. There’s Bellamy challenging Murphy and Echo on their plan to pull the plug on the 300 prisoners in cryosleep on Eligius, saying that they haven’t come this far just to repeat their mistakes. Considering Bellamy was once part of a murderous army, his compassion, even if it comes in the form of leverage against Charmaine and her people, is a step forward. “Eden” and “Red Queen” gave us a glimpse of what these people needed to do to survive. “Sleeping Giants” is the necessary next step, as everyone turns from survival to the hope of progress. This is The 100 though, so that hope might be short-lived. It’ll be interesting to see how the show handles the negotiation between Bellamy and Charmaine. As intimidating as she is, she also seems reasonable, and open to ideas that allow everyone to stay alive. On that same topic, Charmaine is such a welcome addition to the show. We don’t know a lot about her just yet, but she’s already more complicated, and her behavior more understandable, than some of the show’s other villains.